ONTARIO – Toronto-based McEwen Mining has announced plans to spend $20 million for exploration on its properties near Timmins. The company will offer approximately 6.0 million flow-through shares priced at $3.02 each. McEwen says the offer price represents a premium of 25% over the closing price of its common shares on the TSX as of Dec. 5, 2018. The most promising exploration program in 2018 was that at the former Stock mine that produced 137,000 oz. of gold from an underground operation between 1989 and 2005. The property has near surface potential. The Stock East deposit has a combined open pit and underground inferred resource that contains 114,000 oz. of gold in 1.4 million tonnes at a grade of 2.54 g/t. The best Stock East drill result was 25.16 g/t gold over 2.09 metres. 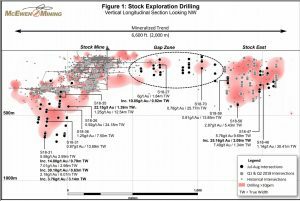 Drilling in the depth extension of the Stock mine returned 25.15 g/t gold over 1.4 metres and 7.01 g/t over 3.0 metres. Besides the producing Black Fox mine, McEwen has four advanced gold exploration projects near Timmins – Buffalo Ankerite, Davidson-Tisdale, Fuller and Paymaster. (Goldcorp has a 39% interest in Paymaster.) McEwen also owns the North Tisdale property which is in the early stages of exploration. The corporate presentation at www.McEwenMining.com contains more information about the exploration program at Stock.